It wasn't too long ago that we revealed Intel's 2009 Processor Roadmap revealing what was in store with the Nehalem 45nm and 32nm CPU microarchitectures. We've seen the Bloomfield processor, the Ferrari of Intel processors, smoke every benchmark record ever set. And, just when the excitement started to level off, we were hit with Lynnfield which by all accounts crushed any performance we ever considered, "mainstream". With the new year, comes new things. The newest of Intel's crop comes to us in the form of the Core i5 and i3 Processors dubbed Clarkdale. And while it's built a little different, it doesn't mean you're due for disappointment. It was designed with a specific purpose. Allow us to break it way down so you don't have to. First, lets recap the Core i5 661 bigger siblings. The 45nm LGA1366 "Bloomfield" and LGA1156 "Lynnfield" arrived fully powered by Quad cores with 8 Hyper-Threads, except for the Core i5 750 which only offered 4 threads. The Bloomfield is fed by three memory channels (Triple Channel). Lynnfield is fed by only two memory channels (Dual Channel). The processor we have in question is the Dual Core i5 661 "Clarkdale" LGA1156 Processor which continues to utilize Dual Channel memory via its integrated controller. Clarkdale heralds in a new micro-architectural era shrinking the die size from 45nm to 32nm. That's 383 Million on-die transistors clocking in at 3.33GHz constantly executing via a total of 4 Hyper-Threads. There's more! The Core i5 661 Clarkdale also features an integrated 45nm Graphics processor with 177 Million on-die transistors calculating at 900MHz. (Core i5 6x0 series offer a 733MHz core frequency.) It offers improved DirectX 10 and OpenGL 2.1 support as well as enhancements to video and 3D performance which smooth HD video playback. This is especially important for Blu-ray content. Nothing can ruin the HD experience like stuttering. Intel Turbo Boost is a new feature that previous processors didn't offer. Not to be confused with Intel SpeedStep which ramps down the frequencies to help conserve resources and power, Turbo Boost automatically and dynamically overclocks one or more processor cores when the system is doing something resource intensive. It can also overclock each core separately depending on the need while Intel SpeedStep will never exceed the CPU's top end frequency. For example, when running most single Threaded video games, only one CPU core is active. If the game is pushing your CPU to its max, Turbo Boost will carry a single 3.33GHz core to about 3.6GHz. This gives the system a little extra performance boost. If both cores are being pushed to their max, both cores will be boosted to 3.6GHz. If your current P55 or P55A motherboard's BIOS supports the new 32nm build, then the BIOS will offer Turbo Boost. Otherwise, it will be grayed out and will be inaccessible. Naturally, most any P55/P55A motherboard should support the Clarkdale depending on the BIOS. Just make sure you double check your vendor before picking one up. Keep in mind that current chipsets and motherboards don't support the Clarkdale's integrated Graphics Processor nor can it access the video portion of the chip. 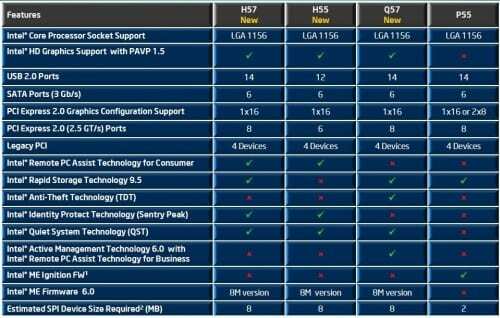 That brings us to the new Intel 5 Series Chipset Family. If you want to access the new low powered integrated graphics, it'll require one of these. The family begins with the micro-ATX H55 Chipset found in the DH55TC Motherboard from the "Media Series" here on the test bench. And, just because these aren't part of the Intel Extreme Desktop Series, doesn't mean they're short on features. Besides all the standard full array of expansion features, there are only a couple major differences. The H55 is the Micro-ATX version, while the H57 and Q57 are full ATX. The Q57 offers both Intel Rapid Storage and Active Management Technology, while the H57 offers only Rapid Storage. There are similar changes to the mobile Intel chipsets as well. 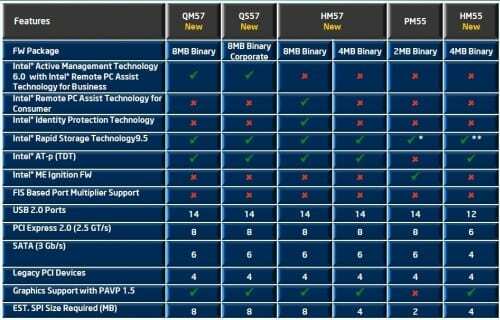 The current PM55 chipset is joined by the HM55, QM57, QS 57, and HM57 Chipsets. 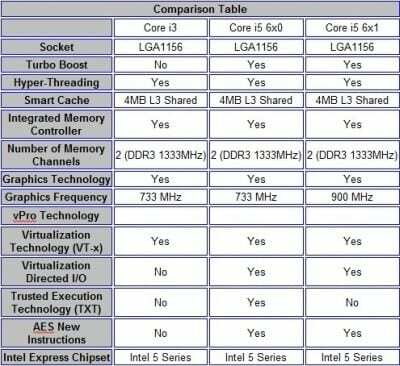 Rather than boggle your mind with a great deal of features and expect you to remember, have a look at the comparison chart below. Some of the more interesting features include the Remote Consumer Assist, Identity Protection (can never have enough security in some areas), Remote Active Management, and Rapid Storage Technology. Rest assured that these mobile chipsets are well tuned to support the emerging SSD (Solid State Drive) market.